Francis Paul “Fran” Murphy, 87, of Canton passed away peacefully on Wednesday, January 16, 2019 at LaPoint’s Adult Home, where he was under the care of Hospice and Palliative Care of the St. Lawrence Valley. Fran was born December 6, 1931 in Potsdam, the son of the late Paul and Mildred (Butler) Murphy. From youth, Fran was fascinated by radio, which expanded to an interest in electronics. 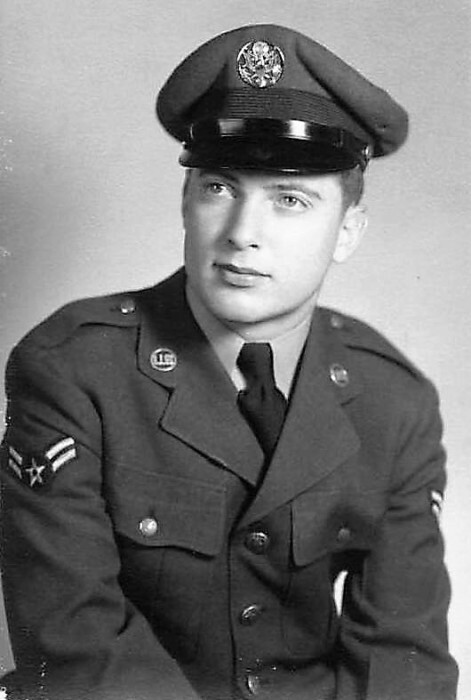 Following graduation from Canton High School, he attended Clarkson University prior to serving his county in the Air Force during the Korean War. His training and work on electronic systems while in the service provided him with the foundation for a career in that field. He established his own radio and TV repair business and worked for St. Lawrence University’s audio-visual department, retiring from SLU to continue a business erecting and maintaining satellite dishes and radio towers, a vocation that took him all over St. Lawrence County. Fran enjoyed 56 years of marriage to Kathleen (Wood) Murphy, prior to her death on March 1, 2013. Fran enjoyed the outdoors. He took his family on hikes and on camping trips in a van he’d adapted for the purpose. Fran loved music, and he, along with Kathleen and their young family, would sing around campfires. In retirement, Fran and Kathleen wintered in Florida, where he was a renowned dancer at the local Moose Lodge and Elk’s Club. In Canton, in later years, he enjoyed trips to the VFW Post, where he will be remember for his Manhattans or Scotch, with a splash of water. He relished the opportunity to take his daily walk around the Partridge Run Golf Course, until arthritis, in his 80’s made the exercise too painful. Francis is survived by his five children, Cynthia, Lawrence, Patricia, Vicky and Colleen; 12 grandchildren, five great-grandchildren; a sister, Mary “Jane” Patrick Murphy, a brother, Robert Murphy and nieces and nephews. In lieu of flowers, the family suggests donations be made to Hospice and Palliative Care of the St. Lawrence Valley, 6805 US Highway 11; Potsdam, New York 13676 (hospiceslc.org) or The ALS Association, Greater NY Chapter, 42 Broad Street, Suite 1724; New York, NY 10004 (als-ny.org). Calling hours will be held on Friday, January 18, 2019 from 4:00 pm to 6:30 pm at the O’Leary Funeral Home, Canton. Mass of Christian Burial will be held on Saturday, January 19, 2019 at 10:00 am at St. Mary’s Catholic Church with Father Bryan Stitt, Pastor, celebrating. Burial will be in the St. Mary’s Cemetery. Memories and condolences may be shared online at www.olearyfuneralservice.com. Arrangements for Francis Paul Murphy are under the care of the O’Leary Funeral Service of Canton.